Christmas time comes with numerous reasons to celebrate. Christmas spirit ignites a sense of unity and passion to celebrate the day with loads of enthusiasm and gaiety. Many times crowded shopping malls and elaborate Christmas dinners bog down even the most spirited of holiday seasons. Why not head out on a stellar vacation to the enchanting Puerto Vallarta. The festive spirit, elaborate celebrations, traditional festivities on board your own private boat charter in Puerto Vallarta make this Caribbean destination the ultimate getaway for family and friends this Christmas. 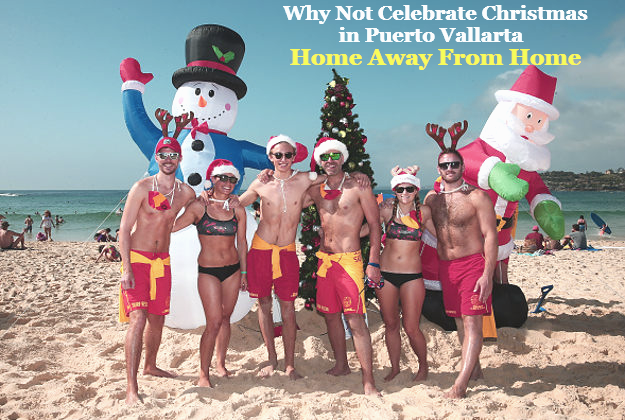 Following are the reasons why most spend their Christmas holidays in Puerto Vallarta. PERFECT PLACE FOR A RELAXING GETAWAY – Vallarta is nestled in between the pristine waters of Banderas Bay and the lush green jungle of the Sierra Madre Mountains. Its sun-soaked beaches are considered the perfect escape for a relaxing vacation. Bask lazily in the sun which will give you the feeling of rejuvenation and refreshment for the upcoming year. The stunning seaside destination is dotted with countless ways to relax and the perfect winter weather, making it all the more incredible serene vacation destination. GO WHALE WATCHING – The month of December is the time when you can spot the biggest celebrities – the Humpback Whales. Hop on a private boat charter in Puerto Vallarta and set sail on the turquoise waters for an epic whale watching adventure. These gentle giants are known to put on amazing demonstrations as they breach, spy hop, tail and fin slap their way into your hearts. Relax and take in the breathtaking panoramic view of the Pacific as you venture along the breeding grounds to watch for these mesmerizing creatures. SPOT SERENITY AT ITS BEST – Although there are available nightclubs and adult-only activities, Puerto Vallarta is not so popular for raging parties. The serene ambiance and friendly vibes of the city create moments of family togetherness, thereby offering a truly memorable experience. During the Christmas vacations, on board your own private boat charter in Puerto Vallarta, get inspired by the elaborate cultural displays and the warm spirit of the Mexican people. There is no better time to schedule a family vacation than during the Christmas holiday season. ACTIVITIES FOR WATER SPORTS ENTHUSIASTS – The warm inviting blue water is what brings the travelers and tourists alike to Puerto Vallarta. They can enjoy all the water activities this paradise has to offer no matter the time of year. The beaches are one of the many fun places to hang out and spend the day. If you want something more, then you can try snorkeling. If scuba diving is one of your favorite activities, there are numerous opportunities you can be part of. Puerto Vallarta is one of the best places for sports fishing in the world. It is home to a number of highly sought after fish. SWIM WITH THE DOLPHINS – A chance to swim with the dolphins in Puerto Vallarta is one activity that is sure to please everyone during your vacation. The program has been designed for even non-swimmers. Under the guidance of an expert, you will get to know about the physiology, anatomy and history of the bottlenose dolphins. It is designed for swimmers of all ages. The participant will interact with the dolphins underwater. Mask, ﬁns and snorkel are provided. Do not miss the chance to get acquainted with these intelligent mammals in their own saltwater pool. WHOLE NEW KIND OF CHRISTMAS SHOPPING – During the holiday season, leave the hustle and bustle of the shopping malls aside and give your family the Christmas gift that provides beautiful memories that last a lifetime. While in Vallarta, spend each day of your vacation doing something that your family members love. Shop for the fascinating Mexican trinkets at the local eclectic flea market. The versatility and diverse objects and attractions available in Puerto Vallarta will make this year’s shopping list the most rewarding one! This could be a great time to experience Christmas in a different culture, and of course, have a Christmas day in the utmost unique way. Boat charter in Puerto Vallarta is the ideal way to spend your Christmas and New Year holidays. Book your boat charter in advance to avoid last minute hassles!